AMMAN- HE Dr. Talal Abu-Ghazaleh, chairman of Talal Abu-Ghazaleh Global (TAG.Global) patronized the graduation of the new CFA charter holders and the annual local Research Challenge of the CFA Society in Jordan, the organization that offers the Chartered Financial Analyst (CFA) in a special ceremony held at the Four Seasons Hotel. 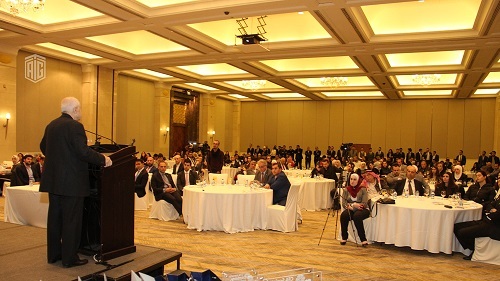 In his keynote speech, Dr. Abu-Ghazaleh expressed his pride in the effort exerted by all graduates requesting them to innovate and plan for a better world for the next generation. "We have witnessed change in almost everything but education. There is something wrong in the education system and I want you as future leaders to lead this change. I want you to become leaders and agents of change. 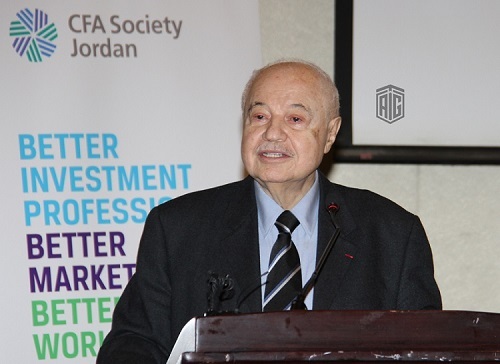 The world needs your effort and dedication in addition to your vision and my advice to you all is to keep on working and never rest because working is good for health," Dr. Abu-Ghazaleh who is also president of the Arab International Association of Certified Public accountants, said. "I need you to focus on innovation and not education similar to our focus at Talal Abu-Ghazaleh University College for Innovation (TAGUCI), an entity where no student will graduate from unless they innovate a new ICT related product or service. The word Education is derived from the Roman root "Educa" which means pull; knowledge is there but you need to pull it," he added. Dr. Abu-Ghazaleh stressed that professional qualifications are vital. "Allow me to share with you some wisdom by a former English teacher who is worth today $35.9B, Jack Ma cofounded and chairs Alibaba Group, one of the world's largest e-commerce businesses who once told his son: "You don’t need to be in the top three in your class, being in the middle is fine, so long as your grades aren't too bad. Only this kind pf person has enough free time to learn other skills," Dr. Abu-Ghazaleh who considers himself still a student, said. "During my speech at Harvard University, I "your avid knowledge advocate" stressed on the future of knowledge, methods for creating learning societies and knowledge economies and how we are able to contribute positively to this sector through a complete transformation into a knowledge society. I am proud to be with you and congratulations to all. Success and failure are the same thing, you only fail when you stop trying," he added. At the end of the ceremony, Dr. Abu-Ghazaleh presented awards to nine graduates who either earned the right to use the CFA designation or recently passed all three levels of the CFA programs and shields to the winners of the Research Challenge competition in which Princess Summaya University for Technology won the top spot. 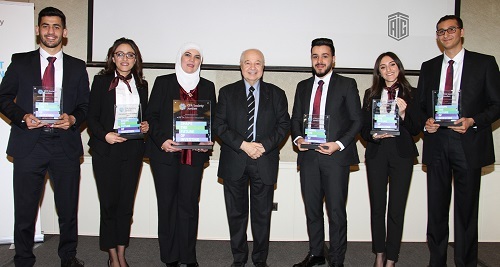 He also awarded graduates and winners with the high-tech Talal Abu-Ghazaleh Laptop (TAGITOP), the first laptop produced with an Arab design and Arab investment. The Research Challenge competition is a global high quality equity research contest among universities. The 2018 participation includes 5,700+ students, 4,000+ volunteers, 1,100+ universities, 150+ CFA Societies, 112 local challenges, taking place in 85 countries across the globe. The participating universities from Jordan this year were: Al Ahliyya Amman University, Hashemite University, University of Jordan, Yarmouk University in addition to Princess Summaya University for Technology. The winning university team from Jordan will advance to the Europe, Middle East & Africa (EMEA) regional finals taking place in Zurich/Switzerland in April.